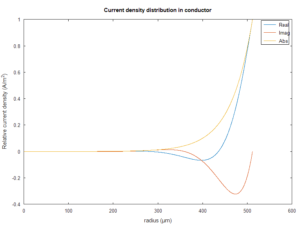 Fig 1 is a plot of the current distribution in a 1mm dia (#18) round copper conductor at 1.8MHz as implied by the model. 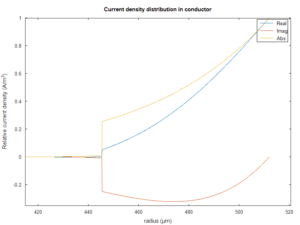 Note that while the magnitude of current decays exponentially with depth, there is an imaginary component that hints a curl of the E and H fields within the conductor. The sum of these complex currents over the cross section area is the total current passing a point, I will call it inti. Power lost in the internal resistance of the conductor in any vanishingly small part of cross section area is simply |I|^2R for the area. The sum of |I|^2R divided by inti calculated above gives the effective resistance. 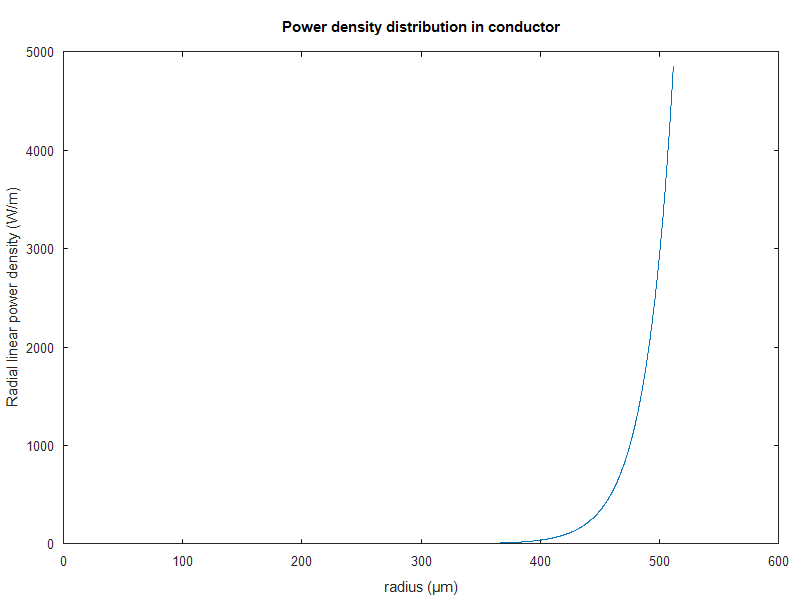 Fig 2 above is a plot of the current density per metre along the radius. 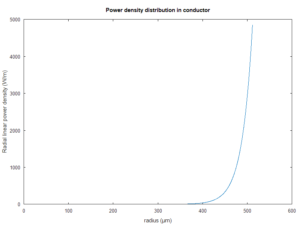 Fig 3 above is a plot of the power density per metre of radius along a radial. It is this that will be summed over the radius to calculate total power lost at current inti. 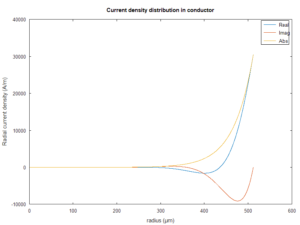 The effective RF resistance is this case is 112mΩ, 5.5 times the DC resistance as a result of the current flowing mainly near the surface of the conductor and much of the conductor cross section not utilised significantly. This case uses a copper cladding of 67µm copper over a steel core for an overall diameter of 1.024mm (#18). 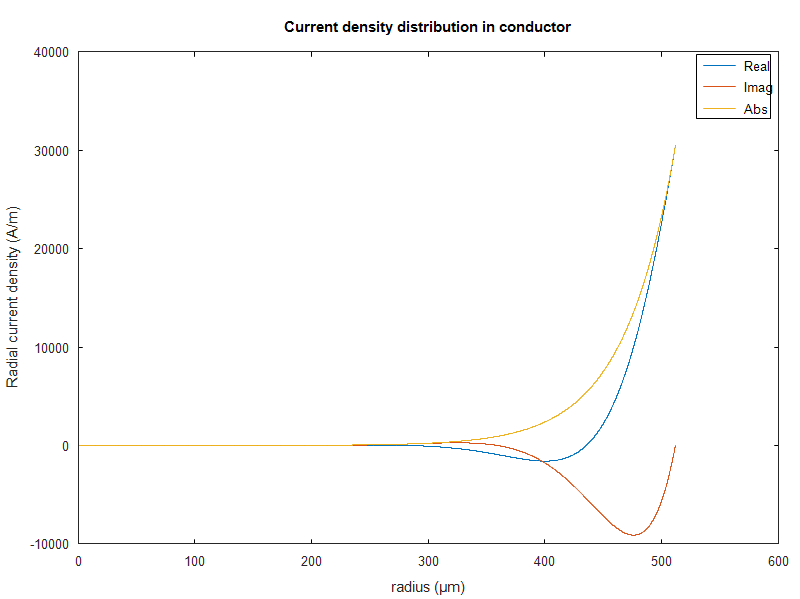 Fig 4 above is the current distribution of the CCS conductor. The cladding is not quite enough to have a distribution almost exactly like the copper case, but it is very close and in fact the effective RF resistance is calculated to be slightly better at 111mΩ. So even down to 1.8MHz, the conductor delivers near to copper like resistance. This case uses a 19 strand conductor with copper cladding of 15.3µm copper over a steel core for an overall diameter of about 1.024mm (#18). At radio frequencies, the current will tend to flow in the outside surface of the outside layer of strands, and can be roughly approximated by a 1.024mm (#18) conductor with 15.3µm copper cladding. 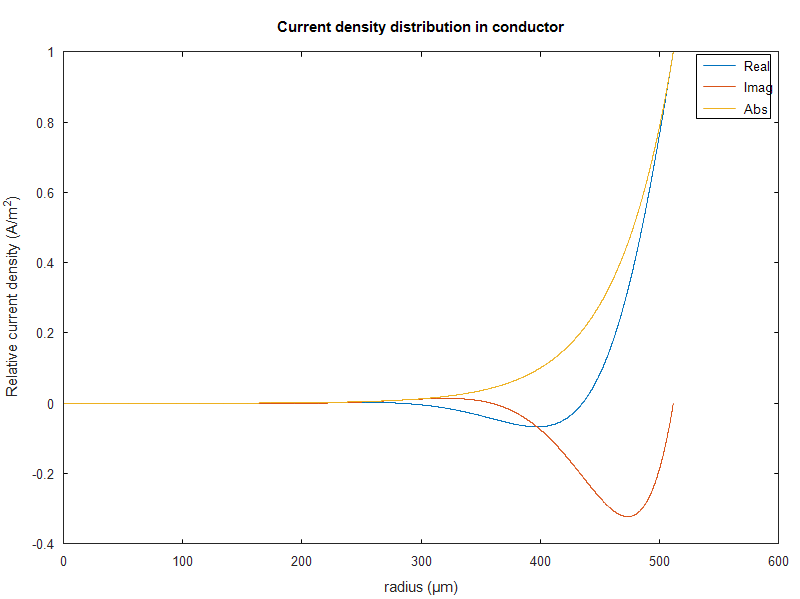 Fig 5 above shows the current of the equivalent CCS conductor. 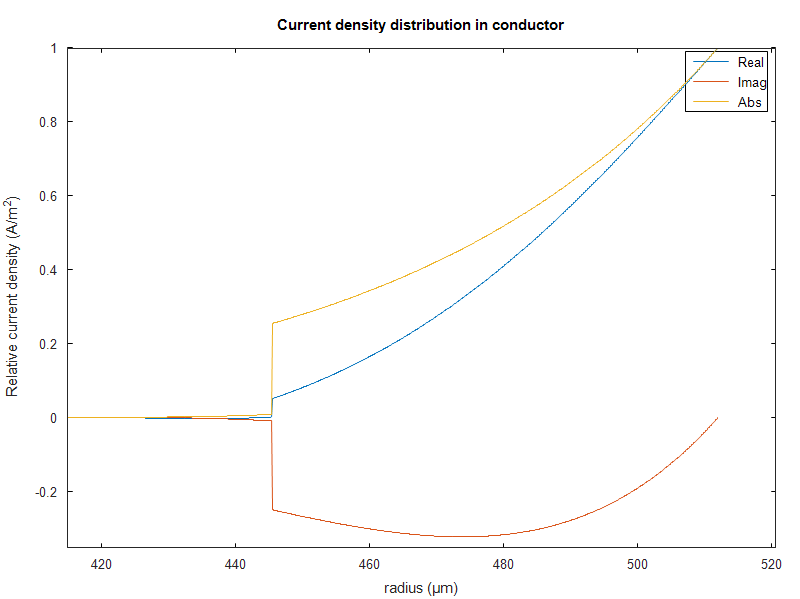 The cladding is too thin to exhibit the copper like distribution, rather we see a truncated part of the distribution which will drive loss up as even less of the conductor cross section is utilised effectively. 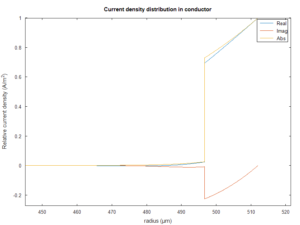 RF resistance is calculated to be significantly higher at 343mΩ. A transmission line using the 19 strand #18 conductor is likely to have about three times the effective RF resistance to the #18 single core conductor at 1.8MHz. 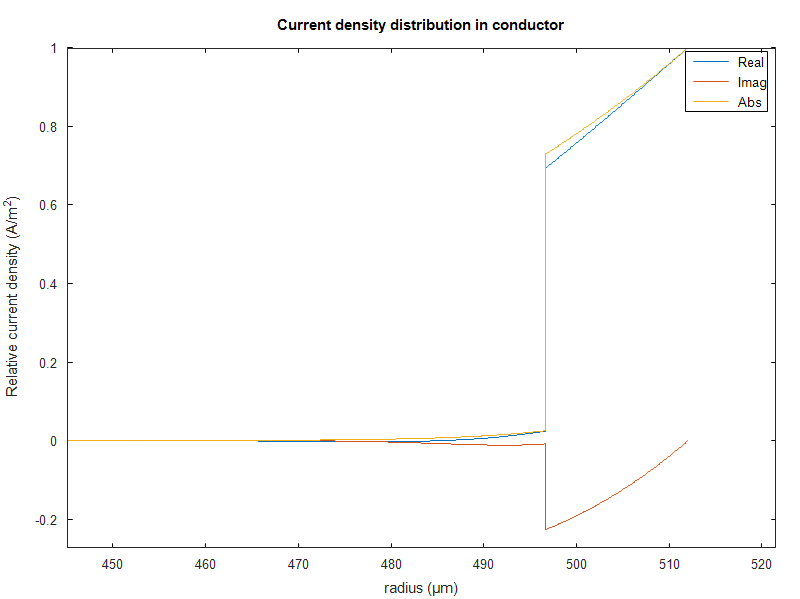 Conductor loss in a matched 400Ω transmission line would be around 0.75dB/100m. That might seem to be a small number but these lines are usually used at high to extreme VSWR and that matched line loss may drive rather high loss under mismatch. Beware of line loss calculators that mostly return unduly optimistic performance figures for this type of line. You might wonder why the ‘premium’ 19 strand line is so popular when it does not deliver copper like performance at MF/HF.